Hubby loves PEAS. He’s always complaining that he never gets enough. Really? (Don’t they always say that?) For me, PEAS belong in tuna casseroles and with creamed chicken. Today I opened up the refrigerator to find two breasts, some ‘shrooms and wine. What to do? Sounds like a night for Chicken Marsala! I wanted to find a light recipe and good old Cooking Light came through! There was an added bonus – the recipe called for PEAS! After reading the reviews of the recipe (of which all were excellent! ), I decided to add my own touches along the way. Shallots, mushrooms, butter, Marsala wine (I use the sweet variety – dry will do as well.) and chicken breasts. The recipe calls for 4 breasts, I only use two…for my breasts are big (hee! hee!) and wanted more sauce to meat ratio. The recipe calls for clarifying the butter which means putting it in the microwave for 45 seconds and letting the milk solids rise to the top. You skim them off and work with the clear (or clarified) butter that is left. Honestly, I don’t think this step is that necessary. Working with the butter as is would work just fine. It all depends on how much you want to fuss. Time to pound the breasts. This is crucial for even cooking and you’ll see why I’m only cooking two breasts instead of four. 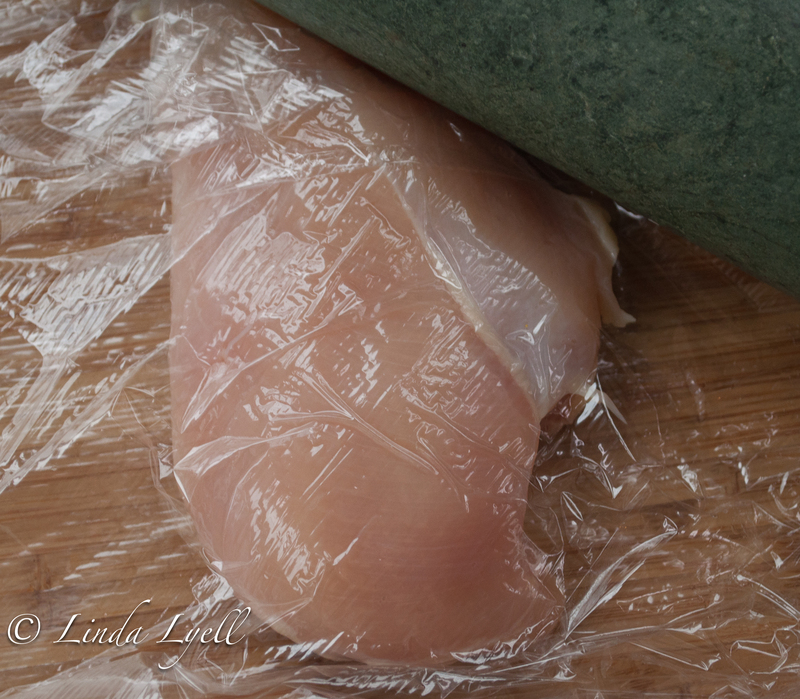 Simply put one between two pieces of Saran Wrap and using your rolling pin, gently pound them flat. You can see now what I’m only using two breasts for this recipe…we ended up having enough for dinner and for a hearty lunch the next day! Time to salt and pepper the breasts…I only allow fresh cracked pepper on my breasts! These babies are now ready for the frying pan! Here’s where I switch it out a bit with sour cream! Low fat of course, didn’t have half & half on hand and I wanted to lighten it up a bit. In a non-stick skillet sprayed with cooking oil, saute mushrooms, garlic and shallots until soft. Remove from pan and set aside. In the same pan, put in the clarified butter and saute the chicken breasts for three minutes on both sides over medium high heat until browned. Remove chicken and set aside. Return the mushroom mixture together with the wine and broth to the pan stirring to scrape up the brown yummies left by the chicken. Bring to a boil, reduce the heat and cook for about 5 minutes so the liquid can reduce to about 1 cup. And yes, add PEAS at this point! The recipe calls for 1/2 cup…but hey, I went for almost a whole cup since Hubby felt so deprived. Heck! You don’t even need to add PEAS if you don’t want to! All depends on the need for PEAS. I served this dish with a wonderful side of pasta. Sometimes you just need to invest in a good pasta that comes close to homemade. Tonight I did. and he got his PEAS! Note on serving: I did slice the breast up in serving as opposed to a big breast on the plate. Less intimidating, ya know? I like simple recipes with lots or aromas intertwined. The main aromatic component in your dish is probably Marsala wine. Would you know of any decent substitute for it? In our only alcohol shop the cheapest (and only) Marsala wine costs 15Euros (21$). Try looking in your grocery store for the cooking version of Marsala wine. It will cost a lost less. This would be OK if I would be leaving anywhere outside Scandinavia (Finland, Sweden, Norway). Here, unfortunately, we still have prohibition and alcoholic drinks in grocery can have maximum of 4.7% alcohol. Other stuff is sold in State controlled shops. Marsala makes everything better. Peas are great too, don’t get me wrong. Great photos, looks like it turned out beautifully.